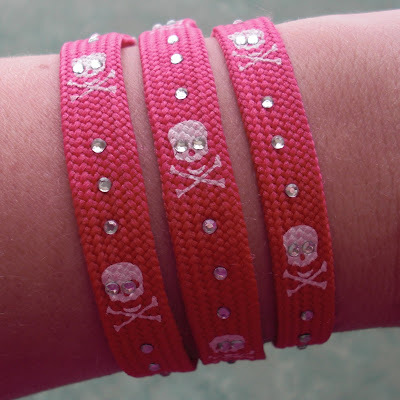 Obsessively Stitching: Rhinestone Bracelets -- from Shoelaces! 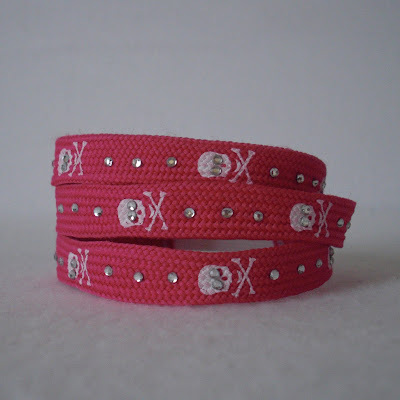 Rhinestone Bracelets -- from Shoelaces! My son's pirate-themed birthday party was this weekend, and I had so much fun thinking about and coming up with party favors. 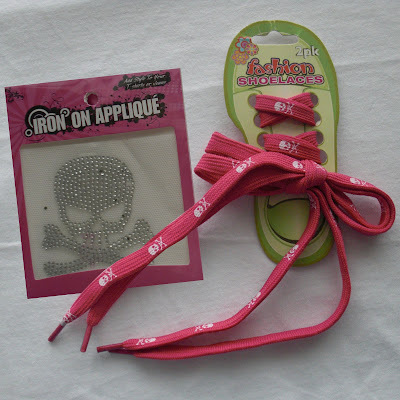 I've been watching the "fashion shoelaces" at the dollar store for a while now, wondering what I could make with them. 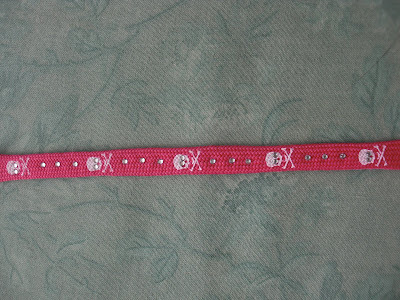 Finally the occasion came, and I came up with these rhinestone-studded skull-and-crossbone bracelets for the girls at the party -- myself included! also at the dollar store! It doesn't matter what the applique is, because you will be taking it apart; I picked the skull because it had the most rhinestones! STEP ONE: Using your tweezers, gently scrape some rhinestones away from the plastic-y sticker covering on your rhinestone applique. Carefully place the rhinestones where you want them. ...so I added a few rhinestones between each skull. STEP THREE: Cut your shoelace. 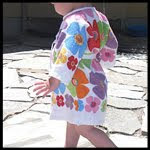 I cut mine approximately 6 1/2" for an adult size. 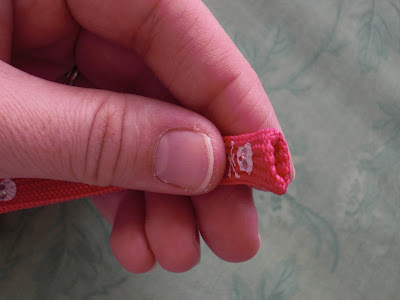 Then tuck the raw edges of one side of the shoelace piece inside. 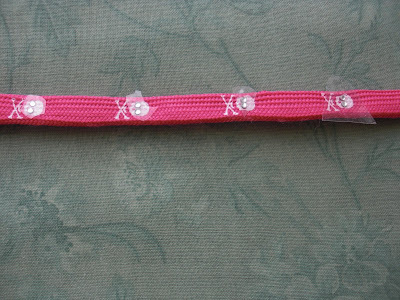 STEP FOUR: Cut a small piece of your elastic. (I cut mine about 2".) 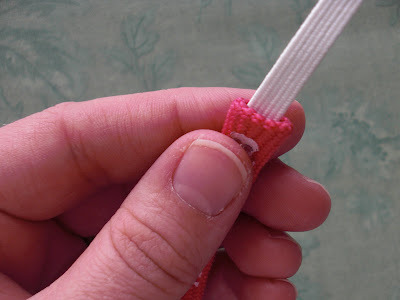 Stuff one end of the elastic into your shoelace. 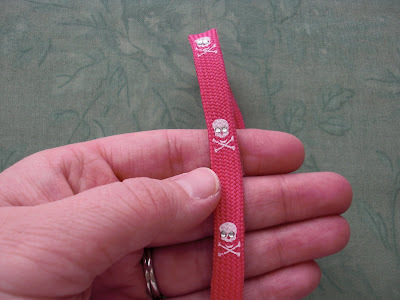 STEP FIVE: Carefully sew over the folded edge, catching the elastic inside. 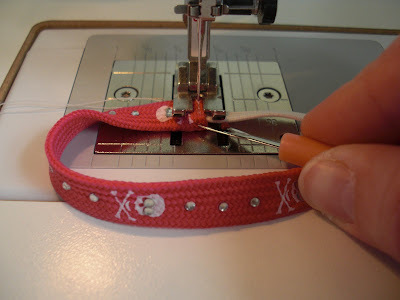 You may need to use a stiletto to push the bracelet through your machine -- I used my seam ripper. 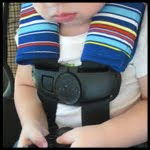 I sewed back and forth three or four times to secure it. 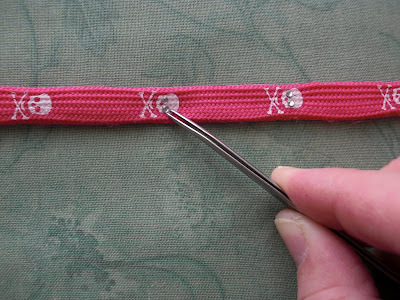 You will then repeat Steps Three through Five to finish the other side of your bracelet. I would LOVE to see a headband version of this!! Wow! I can't get over how creative you are... that is just fabulous! I love this! My daughter wants a luau theme for her birthday. I think I'll go look for some of those flower print ones. 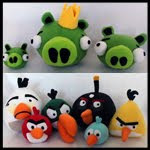 Such a creative project! Good job deconstructing the rhinestone applique. 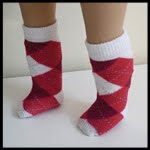 And, even though I've been sewing for a long time, it's all been more or less self-instructed (or mom- and grandma- instructed, but very incompletely) and your mention of a stiletto was an a-ha! moment for me. This has to be one of the most clever, unique, and *smart* crafts ever. I've never even thought of taking apart those rhinestone tatoos, but this is brilliant! Very cute. I will have to give it a try. Too Cute! I think it would make a great headband too. I could so see my oldest daughter (17) wearing one and a matching headband of course not in pink though. So not her color. These are so much fun, I love this idea! Thanks so much for this, I'll be linking. super cute. What a trendy look! Love the rhinestones. I just picked up the supplies to make some for my daughter and her friends! Thank you so much for sharing this! 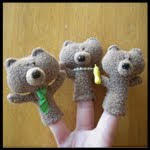 I'll post it on my blog when I finish with a link to your tutorial. 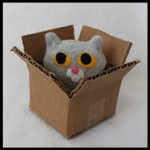 Stop by and visit me sometime! Wow, and you make it look so simple too.